This entry was posted on Tuesday, October 23rd, 2012 at 4:49 pm	and posted in The King of Rock n Roll. You can follow any responses to this entry through the RSS 2.0 feed. Grrr, the Colonel! 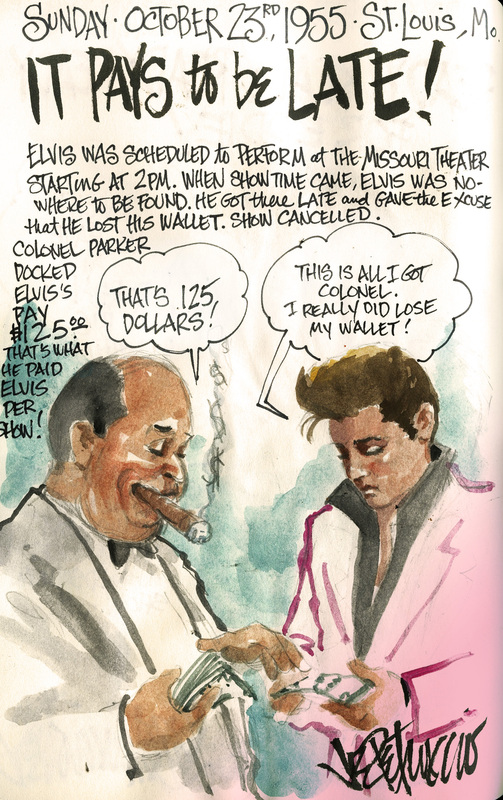 Poor Elvis! I am from St. Louis………so, it breaks my heart that Elvis might have had bad memories of my home town. Even so, there is an iconic picture of Elvis, wearing his iconic jacket, taken in the late ’50’s, completely surrounded by girls with one leaning to kiss him……..taken in St.Louis, I am sure that helped Elvis forget this unpleasant moment ………Joe, maybe someday, you will do that picture justice……..too! TYVM!